"These upgrades demonstrate that it's possible to achieve major cost savings through high-efficiency equipment, while incorporating sustainable building materials and efficient design improvements. Through our partnership with ENGIE Services U.S., Colorado's state buildings are now among the most energy-efficient in the nation." As is true of many agencies during budget-constrained times, much-needed upgrades at Colorado state buildings had been deferred for many years due to higher priorities and shortfalls in state funding. Some of the heating, ventilating and air conditioning infrastructure was more than 80 years old. In 2003, the Colorado Department of Personnel and Administration (DPA) initiated a broad energy efficiency upgrade program at the Colorado Capitol Complex. The State wanted to utilize the Energy Performance Contracting (EPC) Program to implement guaranteed energy efficiency projects. Additionally, the program needed to provide the means to fund projects by leveraging long-term utility cost savings without spending upfront capital. The DPA selected ENGIE Services U.S. (ENGIE) to design and install the comprehensive EPC projects. ENGIE engineered and installed improvements that included energy- efficient lighting systems, energy management systems, water conservation measures, building shell retrofits, removal of old equipment and asbestos, and extensive HVAC upgrades including new boilers, chillers and piping. Renewable energy components included a ground source heating and cooling system at the Governor’s Residence, a 100-kilowatt solar PV system at the Colorado Dept. of Revenue Building, and a 10-kilowatt solar PV system at the State Capitol Building. 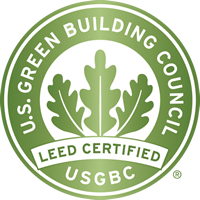 ENGIE also managed the LEED® certification process for five buildings, which received the U.S. Green Building Council’s LEED Certification for Existing Buildings. The Colorado Capitol is the first LEED-certified state capitol in the country and the first facility to receive the LEED for Existing Buildings (LEED-EB) certification. The final phase of work – a geothermal heat exchange project – replaced HVAC system equipment throughout much of the capitol building and will provide cooling to the House and Senate Chambers for the first time in the history of the building. It is one of only two capitol buildings that use geothermal energy for heating and cooling. This project, partially funded by a $4.6 million ARRA grant, demonstrates the successful application of an alternative energy source at a landmark historic building situated in a dense urban setting. Since 2003, multiple phases of self-funding energy efficiency projects have been implemented, making the state’s buildings, including historic landmarks constructed in the late 1800s and early 1900s, among the most energy efficient of their kind in the country. Efficient lighting technology effectively showcases the historic building’s architectural features while minimizing costs and maintenance requirements. In total, roughly $30 million worth of upgrade projects were funded primarily through energy savings generated by the efficiency improvements, along with utility rebates. As a result of these comprehensive facility improvements, the state has reduced its energy costs by more than 30 percent. In total, the EPC projects have saved the state more than $8 million in utility costs, of which more than $5 million were guaranteed, measured and verified by ENGIE. Additional savings expected to be more than $1.5 million continue to accrue each year. Along with the energy savings, other benefits such as improved interior lighting quality and more comfortable indoor environments, reduced maintenance costs, and environmental benefits associated with proper removal of abandoned equipment and asbestos all positively impact occupant comfort as well. Hi, Please send me more information regarding the Success Story for Colorado Capitol Complex. Thank you!